Hair often goes through the ringer in the name of beauty, and sometimes the consequences aren’t understood until the signs of damage start creeping up. When you start to notice a lack of moisture, split ends, breakage, dullness or weak strands, it’s not the end of the world. It just means it’s time for some damage control. To help get your good hair days back, The Salon debunks 8 myths on how to repair damaged hair, along with some handy hair growth tips. If you have oily hair, opt for a dry shampoo in between wash days, and when you do shampoo, concentrate only on the roots—the greasiest parts of the hair. If you’re looking for a quality salon with professionally trained stylists and affordable prices, The Salon is the choice for you. At Hair Salon, you can be confident you’ll get the look you want. You can still rock your regular tight hairstyles. To restore moisture, apply a rich, rinse-out conditioner after every shampoo, a hair mask once a week or a hot oil treatment a few times a month. When using a mask or oil treatment, wear a shower cap to concentrate the moisture on your locks (and avoid messes!). When shopping for a conditioner, be on the lookout for mango, shea and cocoa butters as ingredients; they seal and provide moisture. Palm, jojoba and olive oils give shine and moisture, and hydrolyzed keratin, a protein in hair and skin, strengthens the hair shaft. Looking for DIY options for treatment for damaged hair? Avocado, butter and olive oil have all been known to soften hair. Again, as a possible cause of hair damage, it makes sense to steer clear of heating tools. However, using a flat iron occasionally is fine. Prep carefully by working on completely dry hair (using a straightener on damp hair fries the hair from the inside out—ouch!). You should also apply a leave in treatment for damaged hair that conditions, protects against heat damage and hair breakage and strengthens damaged hair, and use a lower heat setting. 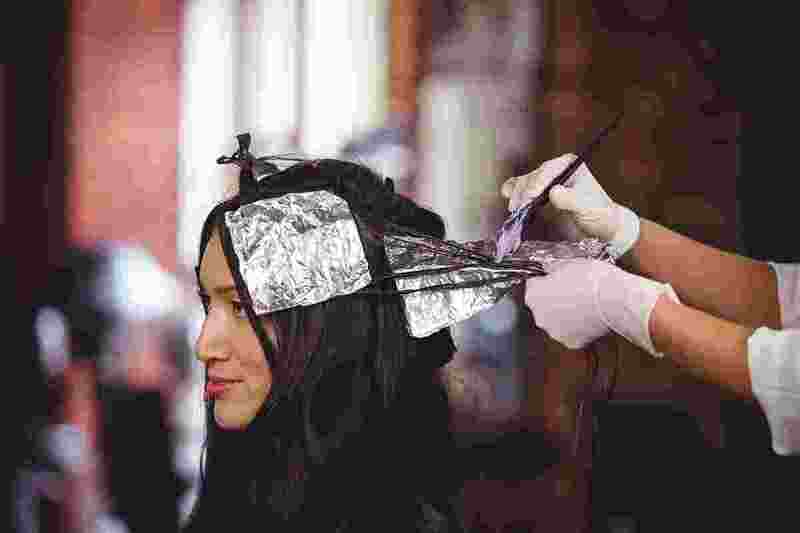 Exposing your hair to even more chemicals when your hair is already damaged may seem crazy, but there are a few instances when coloring damaged hair is ok. If you dye your hair very rarely while your hair is damaged or you only want to touch up your roots with a single process haircolor, it’s ok to color your hair, since hair at the top of your head is healthier and newer than the ends, which tend to be driest and most damaged. Skip the double process haircolor till your hair is healthy again.